Kosherfrugal.com - Frugal Living in Israel: Lego Discount! If you join the Homeschool Buyer's Co-op (FREE!) 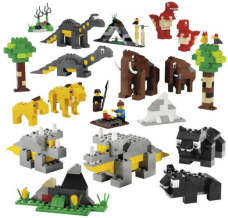 you can get a great discount on Lego Educational sets! We love Legos. Even my 14 yr old still builds with them. He'd be so embarrassed if I wrote "plays with them," so we'll stick with "builds with them". Sorry, this offer ships within the USA only. This was also posted on my Homeschool Resources blog, which I have been seriously neglecting.